Die folgende Beschreibung ist eine automatische Uebersetzung von Mosquito Hostel ist sehr zentral gelegen direkt neben dem Nordeingang der Altstadt und liegt damit nur wenige Gehminuten von allen wichtigen Sehenswürdigkeiten. Das moderne, freundliche Hostel bietet Ihnen jeden Abend Abendessen, Getränke, Spiele und Veranstaltungen - die große Chance, das Personal und die Mitreisenden zu erfüllen. Es gibt auch eine voll ausgestattete Küche, kostenloses Frühstück, kostenlose Wäscherei und kostenlose Wi-Fi und Internet. Wir mögen ihre ermäßigten Touren von Auschwitz, die Salzbergwerk Wieliczka und Zakopane. The Mosquito Hostel - has the perfect location, probably the Best Located hostel in Krakow, close to the Train Station ( 5 min walk) and to the Main Square ( 5 min walk ), so there is no need to drag your heavy luggage through the whole city while trying to find your hostel.
' Mosquito has thought of literally everything a backpacker needs in the hostel. It is a benchmark of what other hostels need to follow ' by Erwin, USA. We are called a Backpackers paradise with awesome facilities where you can drink your own alcohol, enjoy great food, chill out and make friends as well as start out the night the right way. Our facilities include 10 rooms ranging in size from twin / double / triple private rooms to 6 /10 /12 bed dorms (each bed has a thick mattress, comfortable duvet, bed linen, reading lamp and USB port) with three bathrooms ( 24hr hot showers), chill out common area & another common area directly connected with fully equipped kitchen & balcony for smokers. What do you get at Mosquito Hostel Krakow? We are suited to a wide audience since we offer a great combination of party & chill where travelers from all over the world meet and exchange experiences. If you are a person who wants to make new friends, have a beer, enjoy the hostel atmosphere, enjoy Krakow, you are really welcome! Our success is based on the respect to others!!! Our staff works very hard to have a very respectful and peaceful vibe without the crazy drunken atmosphere offered at most other hostels. Our goal is to make you feel like at home and will provide you with a great social atmosphere, as well as be giving you the opportunity to have a good sleep after a busy day of sightseeing the city. Air conditioning/heating in the common areas. MONDAY - At 9 pm you'll have a chance to compete with other travelers during QUIZ NIGHT. TUESDAY - Time for the challenge! Let's beat the other team with FLIP PONG game! WEDNESDAY - you'll have a chance to compete with other travelers during PICTIONARY COMPETITION. THURSDAY - If you want to socialize with other backpackers join us for CIRCLE GAMES. SATURDAY - Let's face it and you won't miss POLISH VODKA SHOTS, will you? ;) Tonight in common room at 9 pm. Be there! SUNDAY - In the evening find out what we play during POLISH WEDDING! Please note that all events at our hostel are free of charge. You just need to sign up for the list! We offer discounted tours to AUSCHWITZ - Birkenau, Wieliczka SALT MINE, Zakopane & others. Pick up from the hostel! Professional guides. All included in the price. If you are arriving early in the morning feel free to check in early and wait for your room or bed in our common area. 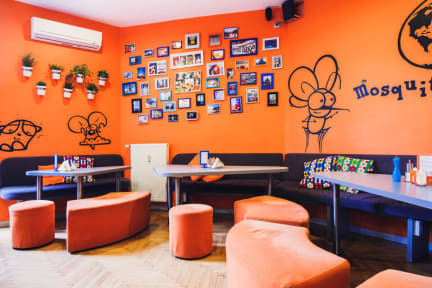 To sum it up...in Mosquito Hostel Krakow you will have a familiar, friendly and young atmosphere where you will find us the whole day always willing to help you find a place to eat, to go out, also to book tickets, find the best deals. If Krakow is the place to be, then Mosquito is the hostel to be at. Please read our 'Things to note' before you make a reservation with us. If you have any questions or doubts do not hesitate to contact us. Perfekt! Bestes Hostel in dem ich je war! Alles ist Sauber, die Mitarbeiter sind engagiert, jeden Abend versammeln sich alle, essen und spielen gemeinsam und wer Lust hat kann danach noch gemeinsam um die Häuser ziehen. Hier Gleichgesinnte und Anschluss zu finden ist überhaupt kein Problem. Sehr zu empfehlen! Super schönes, sehr sauberes Hostel. Gutes Frühstück. Perfekte Lage. Am Abend immer Trinkspiele, aber auch nur nen Bier ist auch ok. Trotzdem nicht laut, sodass man auch mal früh schlafen kann. Perfekt für Alleinreisende. Great stay. Lovely atmosphere, amazing lounge and Gemeinschaftsraum. Rooms are a bit narrow though, but comfy beds and enough for sleeping :) Highly recommend it. Very nice hostel, good location - close to old town. We had a 3 bed room with private bath which was awesome. Comfy beds,free towels. The breakfast is very good. The kitchen provides a lot a spices. Always free tea(Black, green, fruit), hot cocoa and coffee. Awesome people in the hostel, Bord games, reading corner. I am so happy to have booked this hostel. Totally recommend. Grandioses Hostel, wenn man das Gesamtergebnis bewertet. Einige Details können verbessert werden: Die Wassertemperatur in der Einzeldusche ließ sich schwer regulieren. Der Locker konnte verschlossen mit leichtem Ruck dennoch geöffnet werden. Die Duschvorhänge würde ich durch etwas festes ersetzen. Allerdings ganz großes Plus sind die Mitarbeiter! Super nette Mädels sorgen für gute Laune und sind sehr hilfsbereit. Würde definitiv wieder kommen. I spent 4 nights in the hostel and had a great time. Every evening you could have a small dinner and after that there were some activities in the common room (especially as a single traveller it was a good possibility to mingle with other people). The dorm was tight and you often had the problem, that people dried their laundry in the room, so there was a really close air and because some people slept at different times there was no possibility to keep a window (in the winter) open. If are in Kraków for partying, this hostel will be perfect for you. However, if you want to sleep good in the nights to explore the beautiful city by day, you need a good pair of earplugs (very, very thin walls and doors) . Our room (7) was vis a vis the kitchen and you often could not fell asleep until 1 pm. Nevertheless, staff are kind and the furniture of the hostel is appropriate.